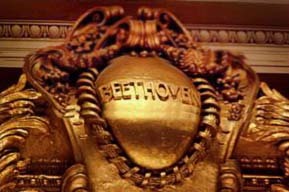 It’s been well over seven decades since the Boston Symphony Orchestra has performed all nine of Beethoven’s symphonies in a single season, and the current four-concert series is actually the first time in which the entire set has been explored in a single, unbroken cycle. Alas, with James Levine flat on his back, he’s been unable to see his intriguingly straightforward programming concept through to fruition. Fortunately, a series of highly capable conductors has stepped in to fill the breech, the latest of whom was the hyper-experienced Lorin Maazel. Maestro Maazel took the helm for the penultimate event, a concert showcasing symphonies 6 and 7 which took place Friday evening, 30 October at Symphony Hall. Throughout the work, the startlingly clear musical representations of the natural world, from trilling brook to onomatopoeic birdcalls Messiaen would have appreciated, were elucidated brilliantly by the instrumentalists. The strings created a lush and coherent sound, the woodwinds sang sweetly, the music breathed and pulsed like a living thing. In a brief “scherzophrenic” episode, the vigorous dancing of country peasants is disrupted by a thunderstorm the likes of which would have quickened the heartbeat of many a jaded storm chaser. The clouds soon pass, however, leaving us with a peaceful sunset. The optimistic final movement melts in one’s mouth like a creamy Halloween treat. Symphony No. 7 in A Major, Opus 72 immediately takes off for the heavens. The tone is emphatic; the driving rhythm makes one want to get up and dance. Actually, Maazel’s conducting was quite dancelike as he spread his arms wide and occasionally reached towards the floor to emphasize a beat. When is someone going to develop the concept of Conductor Aerobics? Sounds like a potential blockbuster for Wii. The second movement features an abrupt mood change as the music takes on a decidedly somber tone. Here, Maazel’s tempo was inappropriately rushed, which resulted in a lack of the profundity and gravitas that are the trademarks of this section. Add to that a couple of uncharacteristic clams from the brass, and the result was the only part of the concert that fell short in the opinion of this listener. Perhaps not coincidentally, the traditional inter-movement coughs and splutters from the Symphony audience were unusually vociferous following this movement. Could this have been the outward manifestation of a bit of subconscious displeasure? The last two movements were right back on track, as we galloped off on the back of a powerful steed. The final Allegro con brio, featuring a great deal of brio, was taken at truly breakneck (or, more aptly, “break-bow”) speed, a tempo which added to the excitement. Maazel contributed to the electrically charged mood by dancing up a storm. Great fun watching this former Wunderkind, who began conducting at the age of nine and had conducted all of the major American orchestras by age fifteen, still enthusiastically pursuing his craft more than six decades later. The finely tuned organism that is the BSO was more than up to the task of this exacting taskmaster. Not surprisingly, the performance precipitated an immediate, thunderous, and prolonged ovation as the sellout crowd leapt to its feet and roared its approval. Might have even put a smile on Ludwig’s face.